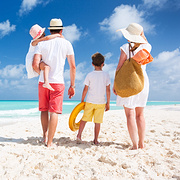 If you are traveling with your children to the Bahama Islands, we offer an assortment of entertaining and educational tours and activities that will delight kids of every age. The Bahamas are home to plentiful opportunities for children to discover the natural marvels of this region. You will not find any activities that spark the imaginations of kids more than our thrilling and interactive ecological tours. Kids jump at the opportunity to witness aquatic life in its native environment. Kids will be enchanted by the beauty and activity of the local coral reefs. While snorkeling, children will view prismatic coral, as well as clown fish that will remind kids of their favorite characters from the animated film, Finding Nemo. Ecological snorkeling excursions allow children to experience the wonders of the Caribbean firsthand. Swimming with the dolphins is the most popular Bahamas kids activities. 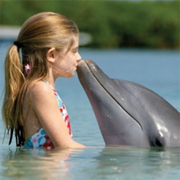 Imagine the smile on your child’s face as he or she experiences getting up close and personal with an actual dolphin, and the precious memories and pictures you would get from that. The dolphin close encounter tours help educate the children while gaining an glimpse into the mammal’s mind by interacting with them. If your child is a little bit older (age 9-17), then we would recommend the Nassau Swim with the Dolphins tour for them to have the chance to get in the water. 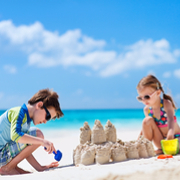 There is no reason why you’re children cannot also enjoy activities while on vacation, while also giving you the peace of mind that they are safe. All of our Kid Friendly tours are up to the highest level of safety, and have been handpicked recommendations by other parents. Ever snorkel with stingrays? 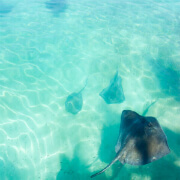 This tour is sure to rays your adrenaline levels and give you a thrilling opportunity to feed and snorkel with southern stingrays on the beautiful Blue Lagoon Islands! 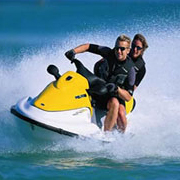 Enjoy our Bahamian beach club and gain access to a variety of activites for the whole family! You can relax on the beach, go swiming, or take part in beachside games. 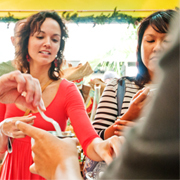 We have three great options to choose from that will satisfy your travel desires! This tour is especially designed for kids ages 4-11 to have a fun, Caribbean experience on the beach! You will be able to relax on our beach chairs as your children play a variety of games in small teams with our entertainment experts! Snorkel without time restraints on our Snorkeling Day Pass. Come and go as you please, our on demand ferry will take you to a beautiful reef any time between 9 and 5. Snorkel as long as you'd like, even break for lunch and come back! Dolphins have fascinated humans for centuries and we offer you the amazing opportunity of interacting with these marvelous marine mammals. 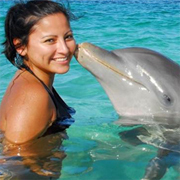 Our dolphin encounters are fun and educational and a wonderful experience for the entire family! Nassau Native Quest, or the QUEST, as we call it, is all about giving you a glimpse into our Bahamian cultural and history. It is a three part adventure that has something for everyone. Relax on the pristine beaches and in the crystal clear waters of Blue Lagoon Island. 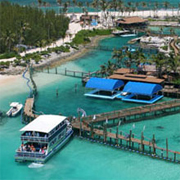 Three miles from the Nassau Harbor, this private island is an oasis away from the tourist crowds. The island has everything you need for lounging, volleyball and basketball, and drift along in the water. Fun for all ages, this interactive encounter with bottle-nosed dolphins gives you exceptional insight into the world of these special marine mammals. Meet the dolphins and their trainers face-to-face, in and out of the water, for an unforgettable experience on Grand Bahama Island.